The Shimano SD5 combines comfort and efficiency to deliver a sandal fit for casual rides or hot bikepacking trips alike. Constructed from durable synthetic leather straps and featuring two hook-and-loop straps, the minimal upper keeps feet well ventilated. 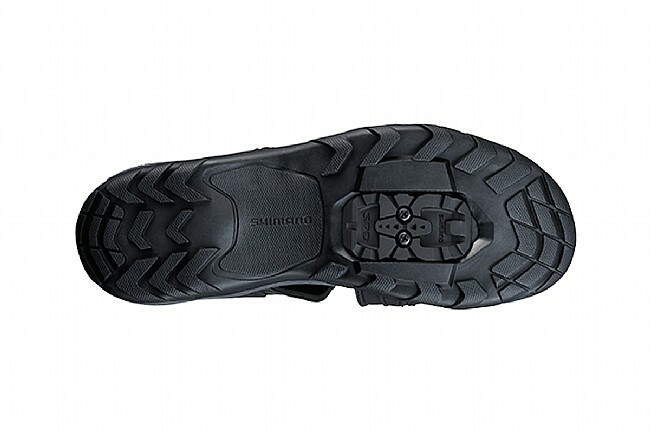 A glass fiber reinforced shank plate reinforces the wide rubber sole to give this sandal a great walking platform and comfortably stiff pedaling interface. Two-strap open top sandal provides optimal ventilation. Mesh lined synthetic leather upper wicks away moisture. Glass fiber reinforced rubber sole makes for easy walking and optimal pedaling. I've used Shimano sandals for years. Long rides or short, they're great. They breathe in the hot weather, are easy to walk on, last a long time. I use these more than I thought I would! The sizing might run a little large. 1- The sizing suggestions aren't really clear. Compared to my regular Tevas, the sandals are narrow (need to be so they don't catch on cranks or chain stays) but long. I ordered two sizes and the better one looked very long on my foot compared to my regular Tevas. BUT - the fit feels good, both pedaling and walking. If you're between sizes, go for the larger one. 2 - Be careful twisting out. 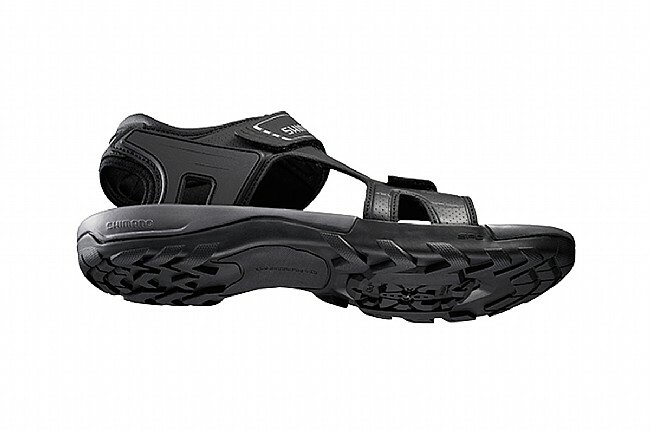 Because they're like Tevas (which is what I wanted), your foot has much more play within the sandal than it does in a regular biking shoe it takes a much bigger twist to uncleat. I had one of those lying-on-the-ground-with-feet-still-clipped-in moments. As usual, in the most public spot possible. Just tighten the straps and be aware. Bottom line - I love them for the short dashes around town. Haven't tried them for a longer ride and probably never will. Sizing is for narrow feet. Need larger size and cut off length. I have ridden in this sandal for years. Keeping a pair going with shoe goo. This new pair does not fit as well. Tried several sizes. Finally got larger somewhat larger size for width and found so long they were hitting spokes. Cut them off with band saw and now ok.
Not as good as previous SH SD60..
Had the SD60 for years and wore them 5 days a week for spin class...great comfort. Unfortunately the new SH SD5 lacks enough stiffness in the foot bed...Not bad if you sit the entire time, but any time spent spent standing on the pedals in a climb will result in sore arches...consider these a waste of money for the sandal and the money it cost to get the clips installed for my purpose. I cycle in a hot and sticky climate and so these shoes are perfect. In the past I used closed-in shoes and the shoe smell would be so bad that I would need to wash my feet after completing a ride because the shoe stench would transfer to my skin. Wash these off and you are ready to go again, plus they are not cumbersome to walk around in when off your cycle at your destination. Check them out but don't forget to order the cleats since they are not included. Best wishes to you and safe riding!!! 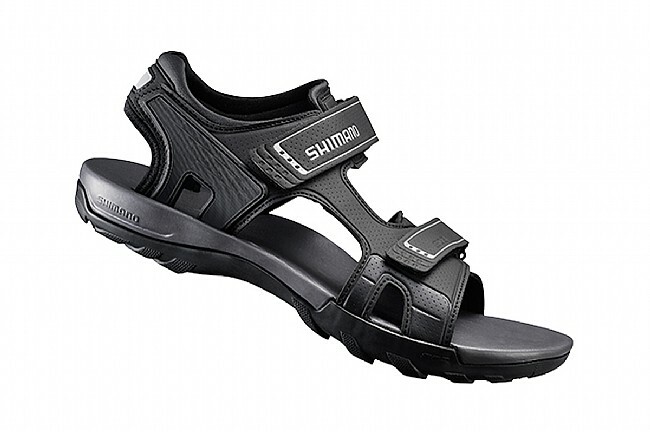 This is the latest version of Shimano's cycling sandal. Earlier models included the original SH-SD60 (two straps), SH-SD65 (three straps), and SH-SD66 (two straps). The newest model SH-SD5 is a complete redesign, lighter, less stiff, and easier to walk in. I've owned both the SH-SD65 and SH-SD5, and prefer the latter. Returned original order for half size smaller, toe room not an issue for sandals. Wore thin socks first few rides until sandal straps softened a bit. Lost one screw on left cleat first time, then reattached both cleats using some threadlock on screws. Nicely cool on feet during warm days. Would buy again. A worthwhile purchase. They fit my feet quite well and they function just like a regular bicycle shoe, but less confining. They are also comfortable for walking around once you get off the bike. Continues my love of all things Shimano. Great sandals. Really changes summer riding on my recumbent HR. I thought I'd only use them for more casual rides, but they're up to performance rides as well. They fit a little bigger than my other closed Shimanos, so if you're somewhere in the middle of the sizing ranges, go for the smaller. I waited a long time for these, had the originals long ago. Didn't like the replacements. Glad they redesigned. Lost my 20 year old pair, so replaced them with the same and I expect another 20 years of use. They are COOL for summer riding, and comfortable for walking too. For recreational cycling in summer, this footwear works well enough on the bike and is cooler than shoes, while being unobtrusive when stopping for food or sightseeing. I would wish only that the footbed were covered with leather, which still cannot be bested for moisture transfer. 12 of 13 customers found this review helpful. I was going to buy a pair of these SH SD5 cycling sandals to replace my SH SD60 cycling sandals that have been my go-to for the past 15 years. As a final gut check, it went to a store and tried them out. Sadly disappointed in what the SH SD5 has become. The SH SD5 look great, but are completely lacking the stiff metal shank that made the SH SD60 so ideal for clicked-in riding. Thumbs down to Shimano for not continuing with the SH SD60 benchmark. Now I have to figure out what to do, because a cleated bike sandal is the best way to ride in the summer. Maybe look into some Keens? I like riding in sandals, especially on the muti-day rides that I do. I don't have to pack socks, and if it rains, these dry out with no waiting period. As for comfort, I find that these are as good or better than a regular bike shoe. The build quality is very good, and I anticipate that they will last for many years. Fit great, just what I wanted for this summer. I have been looking for a sandal that is durable and fits my wide feet. These do the trick. Wonderful , lightweight biking sandals and they fit my narrow feet great !!! sandals I have ever worn. I wish they made one with a closed toe. They would be perfect then!!! Great Sandals. Comfy. Fit a bit big, but it doesn't matter as much with sandals. I would have given 5 value rating, but I am Canadian and the exchange rate and shipping drove the price up very high. Still like the sandals! I am often between sizes, so these were easy to chose correctly. Love them in the dry or wet as long as the temps dont go too low. These and my fat bike have transformed my ideal of all mountain. We've ridden across the USA 4 times wearing Shimano sandals and we were very pleased with them. We wore then on and off the bike so didn't have to take another pair of shoes. After much use it was time for new Shimano sandals. Wish Shimano would make a smaller size. They don't make women's sizes and I had to buy smallest men's size. Works but a little too big.